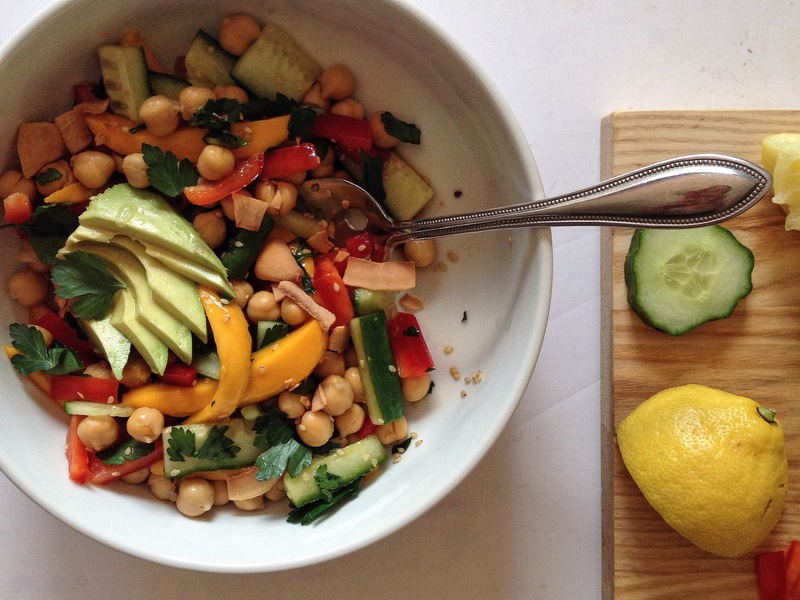 Chickpea & Mango Salad. | Eat More Plants. Salads are SO underrated. They are always passed over, or offered before a meal as preamble or something leading up to the *main event*. Of course not everyone loves salad, or even loves vegetables the way I (and you?) do, but salad doesn’t have to be boring and blah and underwhelming. Chickpeas are often a staple in my salads. They’re not fussy to prepare and they add some meatiness to your dish. Another thing I love about salads is that you never have to conform to a recipe. Use whatever you have in the fridge/ pantry/ counter top and make it work. Today I had a few mangoes (5 for $5 – I couldn’t pass that up), half a bell pepper, green onions, flat leaf parsley, half an avocado and half a cucumber that I wanted to use before it all went to mush. I chopped everything accordingly, except for the avocado which I always add last so it doesn’t get too smushed, and tossed it with about 1 cup of cooked chickpeas. You could get a bit fancier here and roast your chickpeas after dredging them in spices – which I love to do, but didn’t have the time today. Roasting chickpeas @ 400 degrees F for 15-25 minutes usually does the job of getting them crispy on the outside and soft on the inside. Squeeze the lemon over your veg & beans. Whisk together the remaining ingredients in a small bowl and pour over your salad. 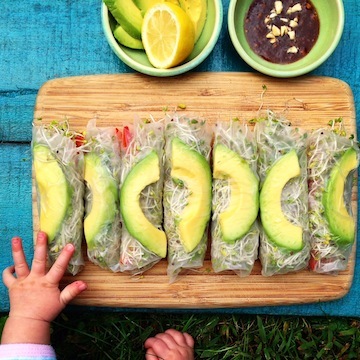 Add avocado and mix gently. If I’m not super hungry or pressed for time, I like to cover the bowl and let it sit for an hour so that the juices from the mango & veggies mix together really well. Ohh! I have all the ingredients for this. I’ll make it tonight! Thanks for the idea. This looks delicious – Will there be new content? This page really inspires us. Thank you for your recipes!